As always... Ultra-prompt, zero-hassle. thankyou. Of course we've only had the batteries a very short while so it's impossible to say how good they are at their job. So I will do this review based on delivery etc. Which was very good. Came the next day, wrapped in plastic on a pallet. Only problem with that was the lorry couldn't get in the drive off the road and the machine they had for carrying the pallet couldn't negotiate the grave on the drive so they had to drop the batteries off on the drive. As we'd had them delivered to our daughter in law who has a small baby she couldn't stand guard over them until we got there so we had to drop everything and rush round. So be warned, they don't come as single batteries weighing 36kg but as one big lump on a pallet weighing 144kg! But so far so good. We have never had numax batteries before and are hoping they'll last us as long (on our canal boat) as the last ones did which was five plus years. Excellent service from Tayna. Batteries are fine and delivery excellent - ordered on a Friday and delivered the following Monday. Everything we wanted out of batteries and more thanks. Bought 3 of these for leisure batteries on my narrowboat. 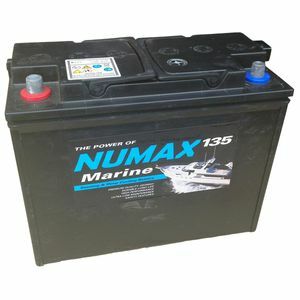 These were the least expensive Numax M135 on the Internet and were replacements for the same batteries. Delivery was prompt and customer service excellent. perfect communication, quick delivery, thanks a lot. From my first contact by telephone, the polite and helpful staff could not have made my purchase simpler. Delivered promptly as promised. I would definitely use your services again and have no problem recommending you to others. Many thanks. Ordering was easy..Battery arrived within 5 days, which for Highlands of Scotland is good,..well packed and arrived in good condition..Have brought before from Tayna and will buy again. Best price in the UK. Delivered promptly and with no fuss, after a polite telephone enquiry to ascertain if they were exactly what I wanted. Two thumbs up. Thankyou Tayna. I ordered on Sunday, the four batteries were in my boat, fitted myself Wednesday afternoon, what more could I ask. Thank you. Battery is what I wanted and is just right for the job I asked Tayna for .